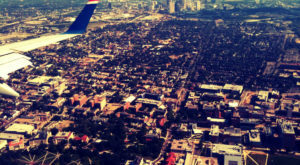 Columbus is a beautiful city with the perfect mix of historic and modern styles, city and nature scenes, and busy and relaxing moods. The city has a special spot for every kind of adventure. 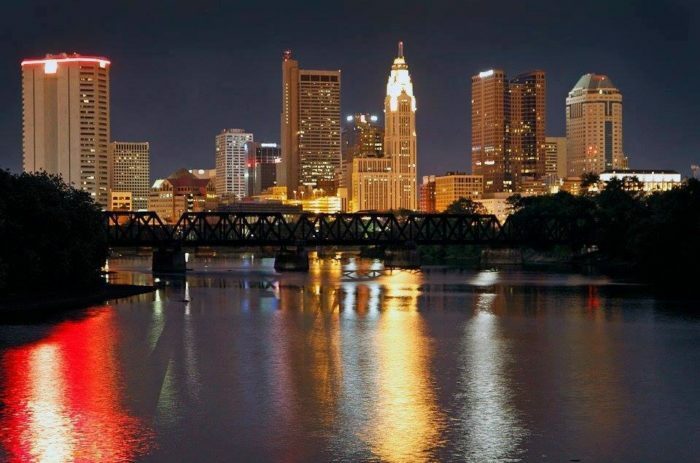 Built around two rivers – the Scioto on the west and the Olentangy in the middle – Columbus offers breathtaking water scenes both downtown and in the many parks scattered throughout the city. 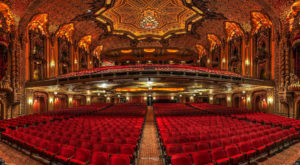 Let’s explore a few of the top views in Columbus! 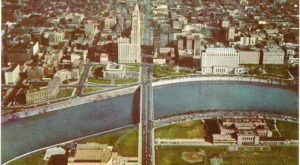 Perhaps the most iconic modern view of Columbus is that of the Main Street Bridge. The massive, yet delicate arch invites visitors to explore the city in its background. Opened in 2010, the Main Street Bridge became the first in North America and the fifth in the world to use an inclined single-rib-tied arch superstructure. The bridge has two lanes for vehicles, and a third wide lane for pedestrians. 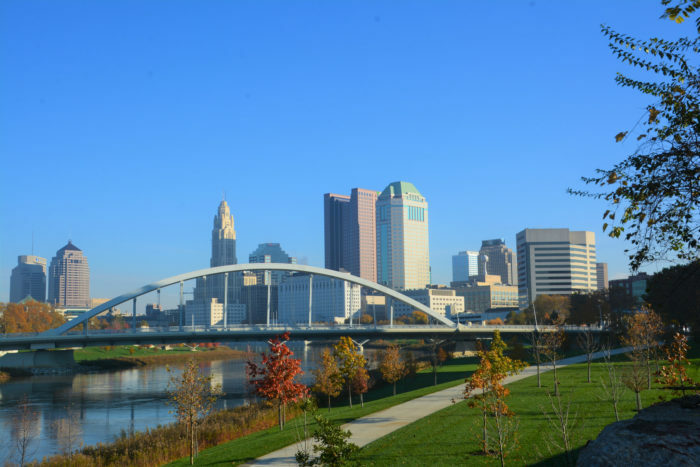 Walk a few minutes from Bicentennial Park down the Lower Scioto Greenway path to get the best view of the bridge and downtown Columbus. Genoa Park is named after Columbus’ Italian sister city, Genoa, the birthplace of the city’s namesake Christopher Columbus. 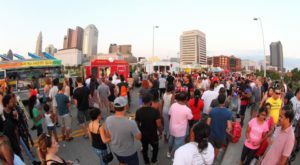 The park provides stunning views of the downtown skyline and frequently holds concerts and festivals. In the evening, people gather here to enjoy the view and the dynamic LED lighting feature of the steps. Genoa Park is home to two of the three "humanized" deer sculptures created by acclaimed artist Terry Allen (the third is located on the Rich Street Bridge, just north of the park). Both locals and visitors love to take selfies with the deer and the stunning backdrop. Across from Genoa Park, on the opposite side of the Scioto River, lies the Scioto Mile Promenade. The Promenade is a beautiful place for an evening walk. 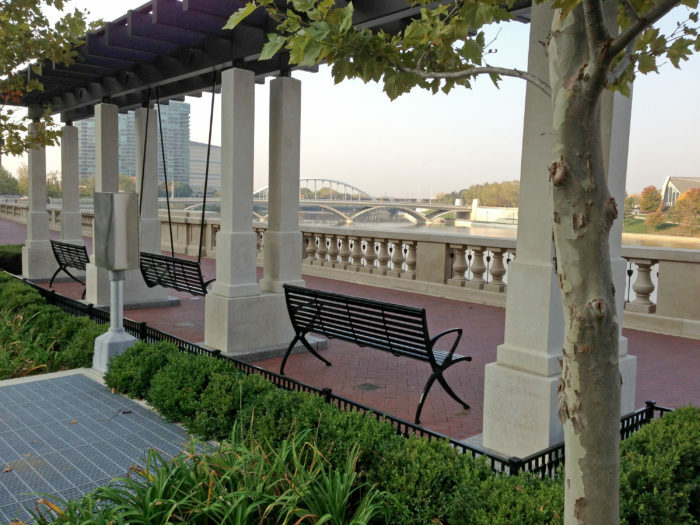 Enjoy the city lights and river views as you sit in one of the shaded swings built into the stone colonnade. This is a wonderful activity for all ages! The Olentangy River flows into the Scioto just north of downtown Columbus. At their confluence stands the Boat House Restaurant with a view that diners can’t get enough of. The Boat House is commonly rented for weddings and other receptions. If you’re not planning to eat at the restaurant, you can also enjoy the view from one of the bike paths that follow the banks of the rivers. 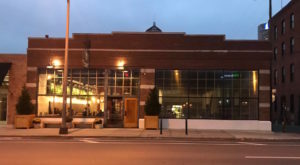 Probably the most popular neighborhood for locals and visitors alike is the Short North Arts District. 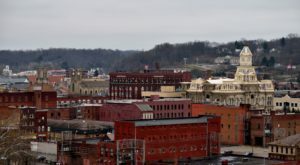 This mile-long stretch of High Street features hundreds of shops, including galleries, boutiques, bars, and restaurants. One of the most recognizable parts of the Short North is its 17 steel arches, which pay homage to the wooden arches first built in 1888, when Columbus became known as "Arch City." 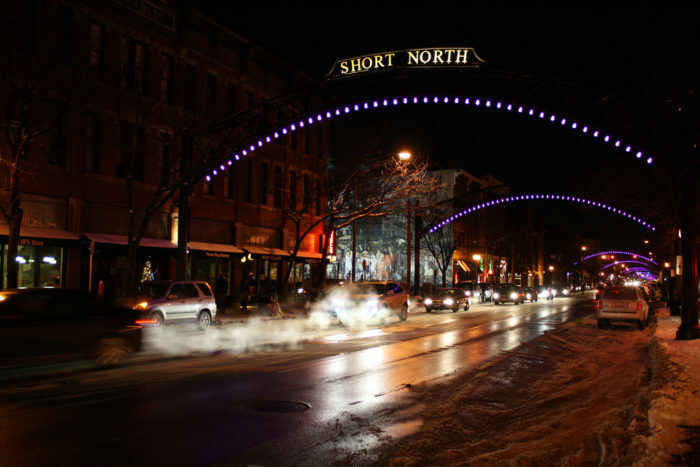 Head to the Short North on any evening, and enjoy the view of the district embraced by the arches as you pop in and out of shops. Just west of the Short North stretch sits the beautiful historic neighborhood known as Victorian Village. Victorian Village is a highly desirable area for homeowners and renters, and many homes are nationally registered historical landmarks. 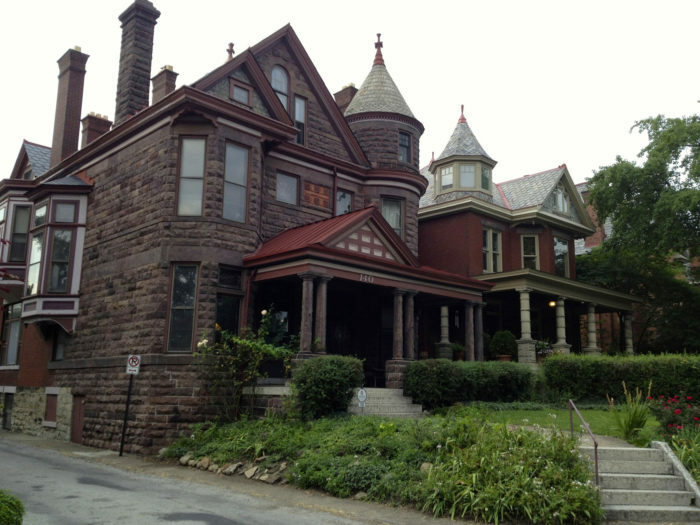 It is rated as the seventh most walkable neighborhood in Columbus, so take a stroll along Neil Avenue and enjoy the incredible Victorian homes. And don’t worry – the owners of these gorgeous houses put a lot of effort into maintaining them, so they will only be happy to see someone admiring their work! On the corner of East Town Street and Washington Avenue in downtown Columbus sits the Topiary Garden, an incredible and very unique park. The grounds recreate Georges Seurat’s famous impressionist painting, "Sunday Afternoon on the Island of La Grande Jatte." The pond represents the river Seine, and the topiaries consists of 54 people, eight boats, three dogs, a monkey, and a cat. 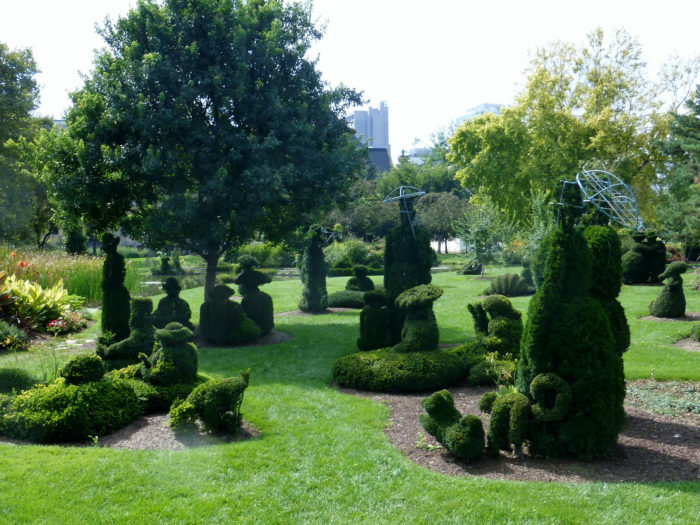 It is the only topiary interpretation of a painting in existence. Walk among the figures for the unique sensation of living inside a masterpiece. This can be a fun way to introduce kids to art! A historic, beautifully preserved, walkable neighborhood just south of downtown Columbus, German Village provides residents and visitors with a "life among the bricks." 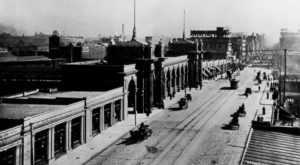 In the 19th century, the area was settled by German immigrants, who at one time comprised as much as a third of the city’s entire population! German Village is one of the world’s premier historic restorations. 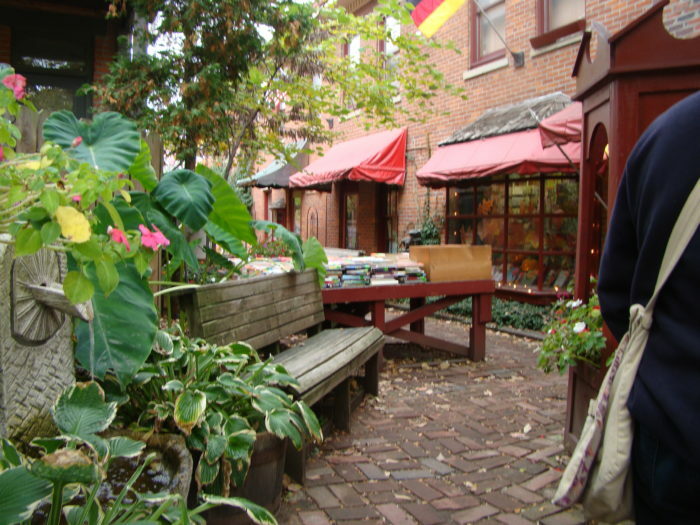 Famous for its brick homes, cobblestone roads, and places like The Book Loft and Schmidt’s Sausage Haus, German Village provides beautiful views at every turn. One of the biggest universities in the country, The Ohio State University has some breathtaking views of its own. For a 360° panoramic view of Columbus, head to the Reading Room on the 11th floor of the Thompson Library. 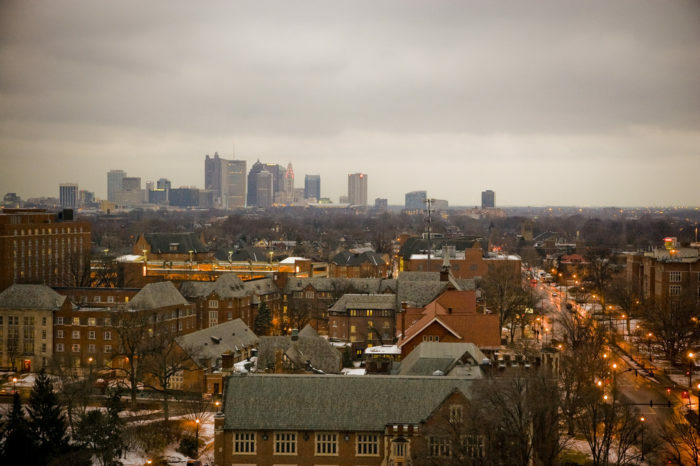 Each window provides a beautiful view of different parts of the city, including the university’s famous "oval" and downtown Columbus. You don’t need to be a student to visit the library, so for the best experience, pick up a book at one of the lower levels of the library and enjoy it with the view of your choice! 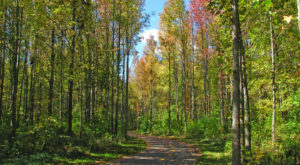 In you’re ready to break away from the city center, head north to the quaint neighborhood of Clintonville, situated along the Olentangy River and High Street. Here you will find the famous Whetstone Park of Roses. 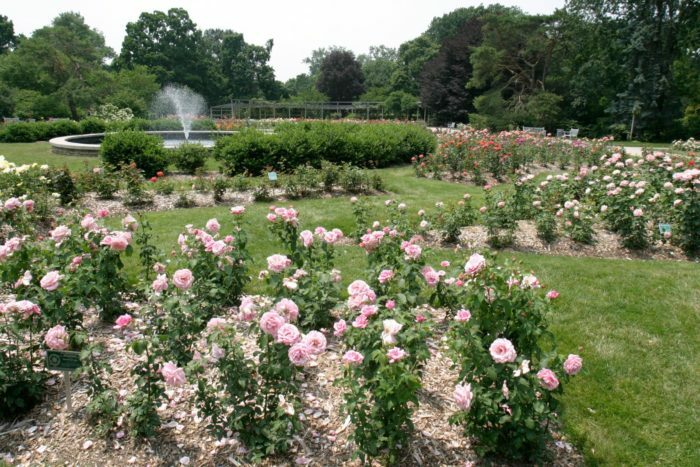 Part of a larger park, this 13-acre plot showcases 11,000 roses consisting of more than 350 different species. Pack a picnic and take the time to smell the roses for an unforgettable experience. Quite a few impressive views, aren’t there? 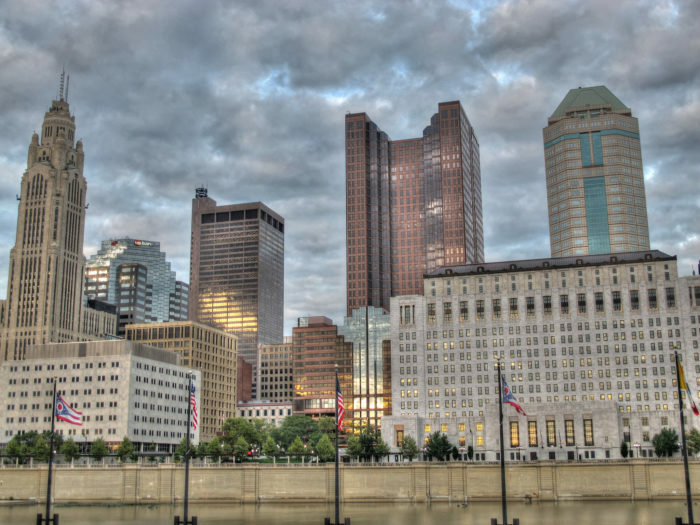 With a city built on the convergence of two rivers, and residents keen on preserving historic neighborhoods, it’s not hard to understand why Columbus is so beautiful! What are your favorite views of the city? Let us know in the comments below, and don’t forget to share your photos for a chance to see them featured on the Only In Columbus Facebook page or on Instagram (@onlyincolumbus).